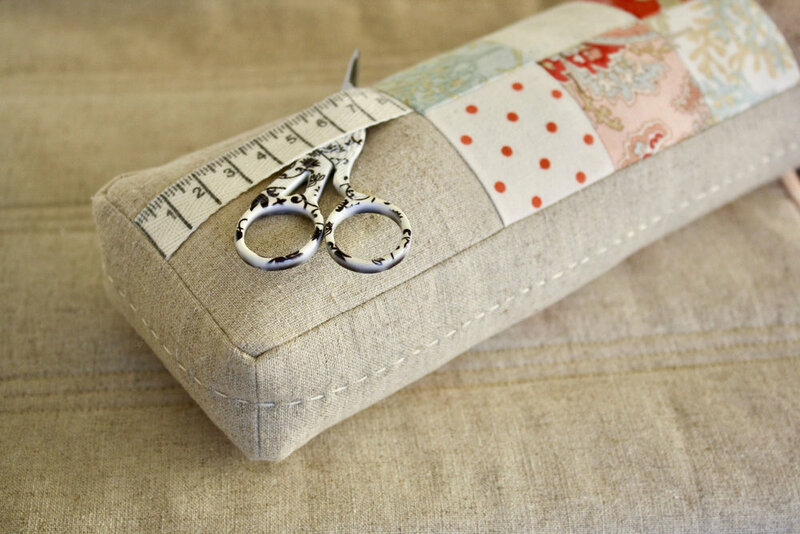 JAZZ UP YOUR SEWING SPACE WITH THREE HANDY ACCESSORIES: A SEWING MACHINE MAT, THREAD CATCHER AND PINCUSHION. The quilted machine mat is designed to sit beneath your sewing machine. It has a pocket panel, which overhangs your workspace, providing lots of storage nooks for your sewing tools of trade. It has piping trim, and is embellished with a twill tape, printed with 'measuring tape' markings. Finished size: 30” wide x 18” long (76cm x 45cm). The thread catcher attaches to the mat using magnetic clips. It is removable for emptying. It has simple running stitch embroidery and pearl button embellishment. Finished size: 4½” wide x 7½” high x 3” deep (11.5cm x 19cm x 7.5cm). 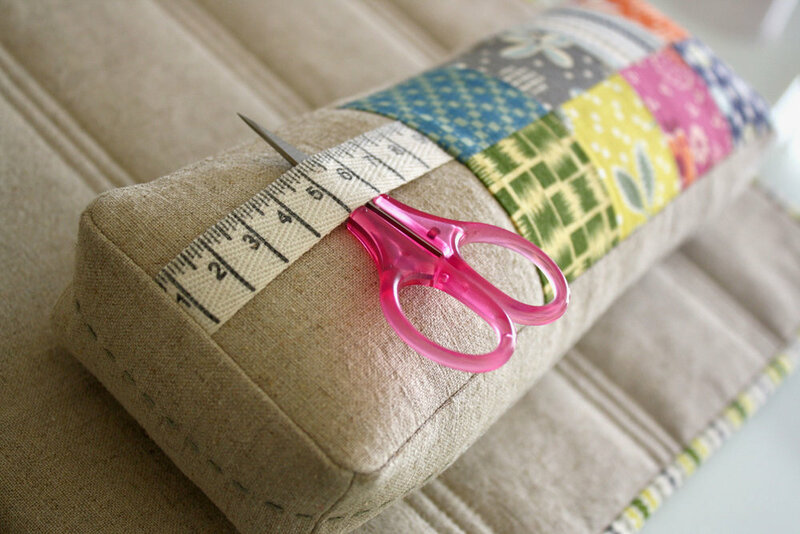 The pincushion is a simple, rectangular design and has a handy scissor keep at one end. It is embellished with running stitch detail on the side panels. Finished size: 9” wide x 1½” high x 3” deep (23cm x 4cm x 7.5cm). Additional details about this pattern can be found at this link. This pattern is an 8-page 2 MB downloadable and printable PDF document. Price is in US dollars. Upon receipt of payment, you will receive an order confirmation to your nominated email address. Please ensure that your email address is correct. The confirmation email will be followed by second email containing a link to the file. This link will expire 24 hours after it is first clicked. Please save or print your copy of the pattern immediately. There are no shipping charges. Please respect that this pattern has taken considerable time and effort to produce. Do not reproduce or distribute this pattern without permission, or use for commercial purposes.